We've come a long way ever since Lisa Caruccio first had her idea of creating a culinary event center on Mercer Island, and now the grand opening for Caruccio’s on September 14th is less than a month away! Suzanne Zahr and her Design-Build team are thrilled to finally light up the Caruccio's site! On August 24th, the Caruccio’s site was officially handed over to the Caruccio’s team for their soft opening weekend. Final inspections were completed just in time for the soft opening, and now they’re up and running, getting acclimated to their new space and making it their own. Suzanne’s team is delighted to see Lisa’s dream fully realized and come to life. Just to show how far the whole team has come, we wanted to share some photos of the last month of construction, along with event photos from the soft opening weekend! 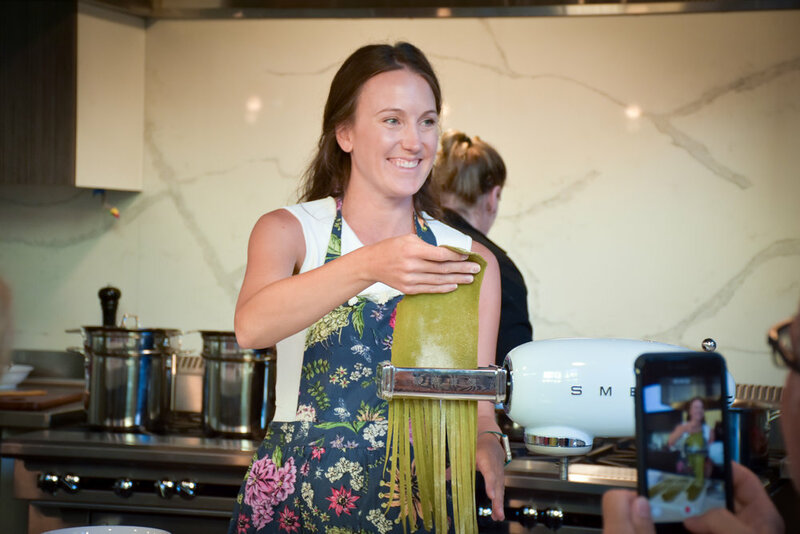 During the soft opening weekend, guest chef Cindy Swain of Italicana Kitchen taught several cooking classes and hosted a pop-up dinner event, all featuring farro, an ancient Italian grain. 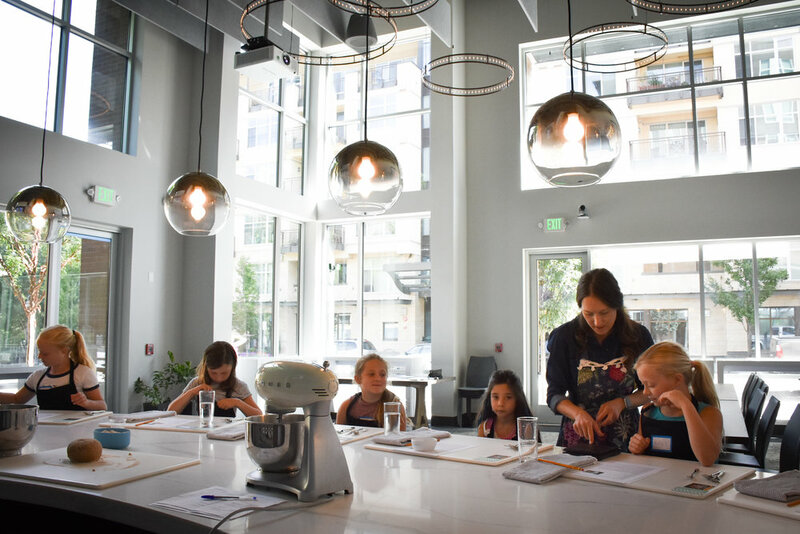 One of the events was a cooking class for kids ages 7 - 12 -- kids had hands-on experience with learning how to make homemade mushroom and ricotta ravioli and a lemon custard tart with fresh fruit on top for dessert. They each received a certificate of completion at the end of the class, making it a truly memorable experience. Suzanne remembers telling Lisa that, with events like this at Caruccio's, she is going to bring a lot of happiness to Mercer Island. 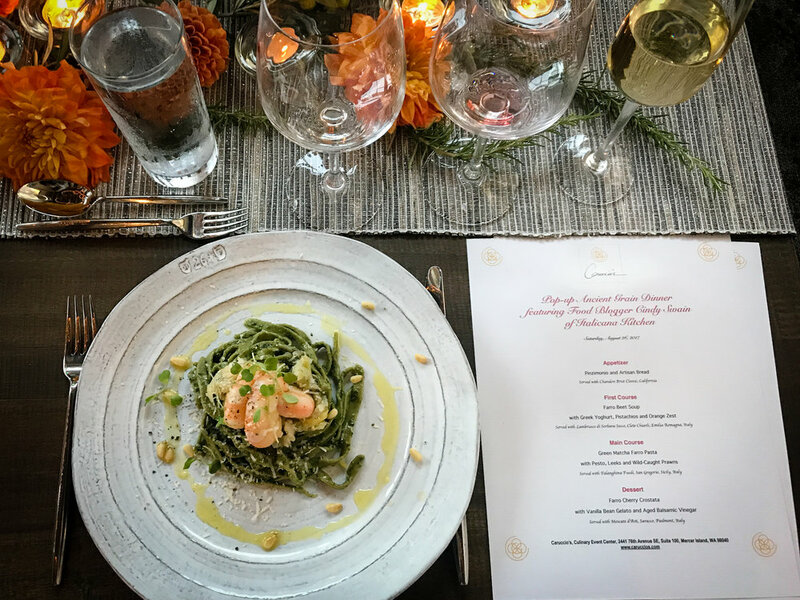 Suzanne had the chance to attend the first pop-up dinner, which was a special treat for her – after all the design and construction, it was nice to be a guest in the brand new space! The three-course dinner featured beet soup, farro pasta with prawns and leeks, and a traditional cherry crostata with ice cream and aged balsamic vinegar. Each dish was perfectly paired with a different wine as well. Suzanne and her team will return to work out a few kinks and finalize the lighting, trim out the cylindrical hearth, complete finishing touches, and ensure the heating and cooling systems are properly calibrated. These last details will all be finished by the Grand Opening on September 14th. Join Caruccio’s on September 14th for their Grand Opening from 4 – 8 pm, with a ribbon cutting ceremony at 5 pm!